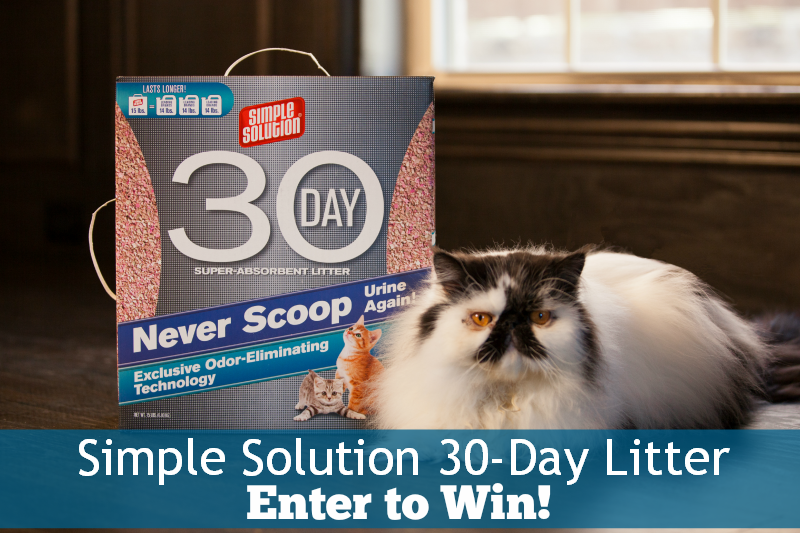 Simple Solution 30 Day Super Absorbent Cat Litter | Enter to Win! If you have cats, it's likely that you've tried to hide that cat litter box smell before. Many cat litter available are scented and only mask the odor of the litter box without actually getting rid of the odors. Today, we're talking about 30-Day Super Absorbent Litter made by Simple Solution. It's a new cat litter that has quite a few unique features. We also have some of this litter to give away to our readers so keep reading! Simple Solution is the only cat litter on the market right now that stays odor free for 30 days. That's a long time! It's a special cat litter that is made from attapulgite clay. Attapulgite clay is a unique lightweight mineral that attaches to, absorbs, and traps moisture and odors. The large surface area and high porosity of this special clay makes it super absorbent. It's 300% more absorbent than traditional litters. 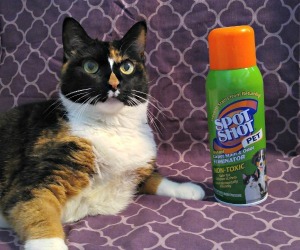 There is no scooping of urine spots with this cat litter. In addition to this, Simple Solution 30-Day Super Absorbent Litter is also about half of the weight of other cat litters. Let's face it, some of these cat litters made from bentonite clay are extremely heavy. 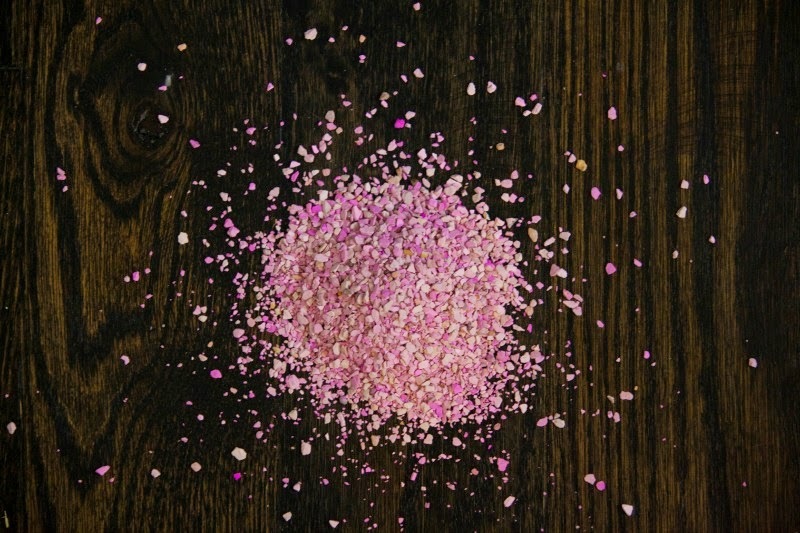 This litter is also low on dust, making it better for people and cats with allergies. And for kitties with sensitive paws, don't worry - the Simple Solution litter is infused with aloe. Now I know what many of you are probably thinking... 30 days is a long time to go without changing the cat's litter. Is that sanitary? Your own judgment on how clean your cat's litter box is probably the best way to decide when to change the litter. The Simple Solution Litter made from attapulgite clay. But I did research a bit about the special attapulgite clay that Simple Solution is made from. Attapulgite clay can be given as a medicine for patients with diarrhea. The clay can cut down the bacterial population in the gut for patients with diarrhea that is caused by an intestinal infection. So it does seem to have some antibacterial properties as well. Regardless of how often you choose to change your cat's litter, the Simple Solution 30-Day Super Absorbent Litter is cost effective. It will last longer than other litters so you'll be spending less and saving money. Simple Solution is also easy to find at Walmart stores. They have a nice store locator feature on their website, which makes it easy to see where you can buy it. Here's a short video about Simple Solution. If you'd like to try some Simple Solution for FREE, we have some for our US and Canadian readers to giveaway! We're giving away 5 of the 9 lb. boxes of Simple Solution 30-Day Super Absorbent Litter to our readers. If you'd like to win, just fill out the Rafflecopter form below. There are many ways to enter, but not all entry options are mandatory. This giveaway will end on May 29th at midnight CST. 5 winners will be selected at random and notified by email. Good luck! This post is sponsored. 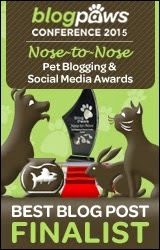 I am being compensated for helping spread the word about Simple Solution, but Pawsitively Pets only shares information we feel is relevant to our readers. Simple Solution is not responsible for the content of this article. That sounds like amazing litter! Wow! 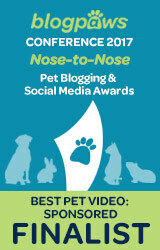 Good luck to all kitties, that's a must have for every user of a litter box! Many thanks for a great review, have a super caturday! I don't know about the litter, but that cat in the photo is quite stunning! Isn't he? I wonder what kind he is. Kind of looks like an exotic shorthair. Not sure about that litter. We use the litter from Aldi and it works great for my cats. I don't think I've heard of that one before Emma. Sounds good, if only we would live on the other side of the pond! I am possibly considering changing litters because the litter that I couldn't use has greatly reduced the size of their bags and increased cost. But....I have a feeling that this litter isn't flushable, right? Aw that's too bad Caren. I did not come across any information about this litter being flushable, so I think it's safe to assume it is not. It sounds like great stuff and I like the pink color! LOL. Less dusty is always good, but I hesitate to switch litters because our older cat does not like change very much! We've been hearing good things about this litter. Though we really like the litter we use now (Dr. Elsey) and the mom says don't change something when you got a good thing going...so we won't enter the giveaway. Good luck to everyone! Well, that's a good point guys! Haven't heard of that litter before. I would like this because as you know, we have three kitties in our house, and we are always on the lookout for good kitty litter! My local shelters and pet food pantry are *always* in need of litter- I'd love to donate this! Excellent idea - good luck Kate! I’d like to try it cos it’s pink and it seems too good to be true. I want to try this because I'm always on the lookout for an improvement in cat litter. I'm curious to see how it works. I have 2 cats who pee a lot! I am a big fan of Cats Pride. No dust, lots of coupons available and I like the company mission and ethics. I would like to compare the Simple-Solution to Cats Pride as a test to see if I should switch. I like the fact that it is low in dust. The current litter I use makes a dusty mess. I want my house to stop smelling like cat litter when I get home. I would love to try this litter.... My housemate is litter dust sensitive so it would be nice to see if there is other options avail for her. :) Thanks for this opportunity! I would love to try this since I have five indoor cats and I like to keep my house clean and odor free. It has been time for a new innovative litter solution to come on the market. Kit and I would love to try this new litter out.... for me the box won't be as heavy to lift and for both of us less dust. WIN, WIN! Have 3 kitties, the boyfriend is about ready to throw us all out because of the "unpleasant" odor. Help! we don't want to be homeless! We have 5 cats. This would be amazing. I can't tell you how much of a blessing it would be to find the perfect litter. Our cats are truly part of the family and we would be so grateful for a chance to try to free box of this litter! Aw what a sweet story! I hope that he starts to fell better soon! And good luck too. I have three cats and they seem to like different types of litter; I'd like to see if this is one they could all agree on. I have really wanted to try some new litters. I used to use World's Best but that hasn't been agreeing with my cat. Would love to try this litter!! I'd love to try this litter!